Enrique Penalosa, former Mayor of Bogota, spoke at the International Transport Forum in Leipzig today and he brought an interesting observation to the discussion. Millions of dollars are spent protecting frogs and lizards but pedestrians and cyclists often suffer from lack of infrastructure. It's a great comment. Ranking frogs higher than humans in our spending. What an impressive, expensive structure. I'm pleased that the wildlife doesn't have to suffer the destructive capability of the automobile. Hell, they don't even have to suffer SEEING the cars because of the foliage. 30,000 cars a day pass this point in Banff National Park in the summer. Which, however, is a number similar to the number of cars on many city streets. Here is a link to several other photos of these overpasses. 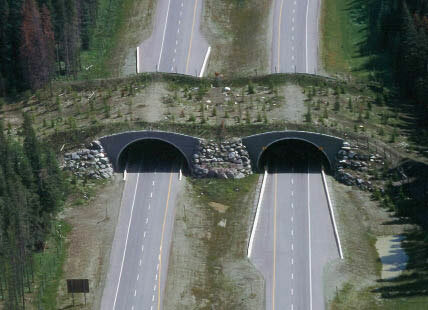 This overpass was built JUST for wildlife (no humans allowed!). It’s on the Trans-Canada Highway in Banff National Park, which serves more than 30,000 vehicles a day in summer. As you can imagine, fencing this wide and very busy roadway has greatly reduced roadkills. But without crossing structures, park wildlife would be unable to move from one side of the valley to the other. And wild animals need to move freely throughout their habitat to stay healthy. It's quite easy to see Penalosa's point. Great sums of money spent to protect animals but very little money spent to protect humans on bicycles or foot in our cities. Look at the last sentence in the text from Parks Canada. Human beings are no different. They need to move freely throughout their habitat to stay healthy, too. If someone could tell me how much these overpasses cost, I'll tell how many km of cycle tracks could be built for the same money. 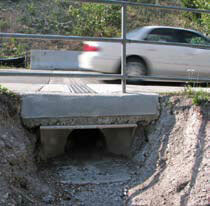 On the same website you can see an example of wildlife underpasses. The one above, from Wateron Lakes National Park, is designed specifically for long-toed salamanders. There are also 27 underpasses along the Trans-Canada Highway through Banff National Park, in addition to the overpasses. In Davis, California, cute houses are built to hide tunnels that help frogs cross the street. The company Theiss is proud of their highway fauna crossings in Australia, as you can see on their website. Although you can also read that "187,000 seedlings were planted, eventually equating to taking 1265 cars off the road.". Ignoring the Bull and Greenwashing all at once. Plant trees, sure, but please don't pretend it reduces car traffic. Seedlings, as far as I'm aware, don't kill people in collisions. Wildlife crossings were first built in the 1950's, in France. The 1950's really are a pivotal decade in urban mobility and not at all in a positive sense. The post-war prosperity that led to the explosive automobile boom in that decade. It was in the 50's that bicycle usage started to drop in cities all around the world as urban planners started to think car first and pedestrians/cyclists second. The cycle tracks in Copenhagen started to be removed in the 1950's to make space for cars and only reappeared in the 1980's. This Wikipedia page has lots of information about wildlife crossings or ecoducts. They are found in many countries. Densely populated Netherlands is one nation that has many wildlife crossing solutions. But they invest, of course, in protecting their human cyclists first. So that's what Penalosa was on about. And rightly so. Protect the wildlife with large amounts of taxpayers money. Absolutely. But don't do it without providing homo sapians in our cities with safe bicycle infrastructure and safe pedestrian facilities. Safe urban mobility is a basic human right that deserves investment and vision.